The Zeonic Geofront: All Hail the Queen! 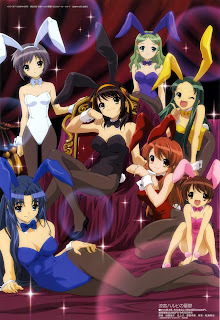 HARUHI the MOVIE! Announced at the conclusion of the new season of Haruhi was the reveal of "The Disappearance of Haruhi Suzumiya the Movie"! I guess half of the ridiculousness involving this last season was to keep people confused and frustrated as to not let it be leaked that this film was in production. I think it will probably hurt the film a little becuase now, anything involving Haruhi will be met with a heavy dose of skeptisim as to what trick they will try and pull this time. And I can pretty much guarantee they will try and pull something. I wouldn't be surprised if the first ten minutes of the movie start off like an "Endless Eight" episode just to get the loudest collective groan in the history of cinema.